The close cooperation with Renault Vélizy went smoothly. Their support was straightforward and made the tight schedules possible. The first consignment arrived in Otelfingen by June 27th the vehicle was built around a spacious passenger cell of 2000L volume. 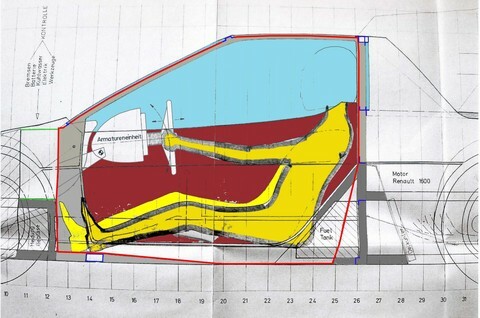 First sketches for the 2+1 concept show a collapsible middle seat. This solution was never a genuine 3-seater as the Matra Bagheera, but provided the space needed for a small “child” seat or hand luggage. Particular emphasis was placed on drivers comfort. Doors with a simple mechanism for opening the polycarbonate windows, met with specification demands. Driver seat, pedal-unit and steering wheel were adjustable to accommodate tall drivers. The passenger cell, made of 0.5mm body sheet for resistance spot welding, was to be built direct on the chassis frame and provided torsional rigidity. To build the passenger cell a wooden tool frame was required. 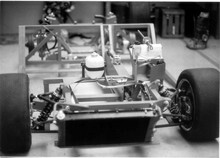 The chassis tubular frame had to redesigned to accommodate the 2+1 seats and the mid engine layout. Wheelbase of 2.40m and track 1.50m were stipulated. The front featured an asymmetrically placed radiator from Renault. The front suspension and disc brakes with ATE callipers was similar to the P1 chassis. Rack pinion steering unit was from Renault stock. The water cooling pipes passed through the mid tunnel allowed installation of an optional heating/fan system. All daily check components were situated in one compartment, just in front of the windscreen. Additionally a small storage space of 54 L was available for luggage. Fuel tank and pump were situated behind the seats and fuel cap located on the right side. On Renault’s specific request an oil cooler was installed on the right side as the exhaust system went on the left. The rear accommodated the Renault 1600cc mid-engine with 5 speed gearbox. Above the gearbox the spare tyre was stored. Rear suspension needed to adapt to the Renault power and was designed from new. Brake drums for the rear wheels were again used for simplicity, but later Renault discs and callipers were planned. Own designed(!) alloy 15” rims on 205/60 tyres were selected to underline the company’s approach as a car manufacturer. Concept design began in June and the full set of engineering drawings needed for workshop and suppliers were finished at the end of August. Work on the body details continued during September. One has to consider that CAD was not available at that time. Even with the support of the Renault engineers, it was quite an achievement for the tiny Fahrzeugbau AG operation. The Body was initially planned to be built partially by a specialist in Varese, Northern Italy. The cooperation with the Italian coachbuilder never materialized due the pending budget. Styling elements, inspired by geometric designs, were not innovative but modern at that time. Basic dimensions were: Overall length 3.90m, width 1.80m and height 1.25m. Alternative negotiations were conducted with Erwin Schill, owner of Carrosserie Caruna AG, Spreitenbach, to build the passenger cell and alu doors, early Oct.’74. The non supporting front and back hood and side parts would be made in fibreglass by René Jäger, in Berneck. Erwin Schill brought some good ideas for the tooling of the passenger cell and doors due to his experience as a coachbuilder. He requested payment up front which was not released. By end of November 1974, one P2 rolling chassis prototype was completed at the factory, ready to be taken to Erwin Schill’s workshop to build the passenger cell and doors. The P2 chassis was in running conditions. But the needed funds for the bodywork, still did not arrive. Sales of the Swiss Buggy dropped sharply in the 2nd half of 1974. During October only a handful of buggies were sold due to the ongoing energy crisis, but the miracle of course never happened and with the economic environment, the company could not continue raising funds for the P2 Renault project any further. 7' 10" 5' 4" 4' 9" 9' 9" 5' 10" 0 (0) 0' 0"